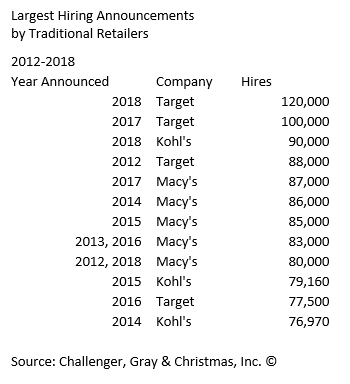 UPDATE Holiday Hiring Plans Signal Hot Year for Retail | Challenger, Gray & Christmas, Inc.
Last Thursday, Target announced it planned to hire 120,000 workers for the holiday season, surpassing last year by 20 percent. This is the largest holiday hiring plan by a traditional retailer since Challenger began tracking these announcements in 2012. It is equal only to Amazon's announcement to hire 120,000 workers in 2017. Meanwhile, JCPenney told Challenger it planned to hire "over 39,000" workers for the holiday season, down slightly from the 40,000 it announced last year. In July, the retailer announced plans to hire 18,000 seasonal workers for back-to-school shopping. Both Kohl's and Radial have announced local hiring plans, although Challenger has yet to confirm overall counts. So far this season, Challenger has tracked, 13,118 announced hiring plans by Radial through news reports. The logistics company announced 23,000 hiring plans last year. Challenger has tracked nearly 400,000 holiday hiring announcements so far this year. UPDATE: Challenger has tracked over 589,000 holiday hiring announcements so far this year.